It's not hard to understand why some of the world's largest corporations have made huge investments in metal 3-D printing recently. Manufacturing metal parts at scale currently requires companies to navigate complex global supply chains that take an unavoidable chunk out of the bottom line. However, the cost, complexity, and time associated with metal 3-D printing has ensured the technology's mark on the multi-trillion-dollar manufacturing industry remains minimal. Desktop Metal is working to change that. Later this year, the company will begin shipping early versions of its Production System, a 3-D printer that can produce up to 100,000 metal parts at a cost and speed competitive with traditional manufacturing methods. 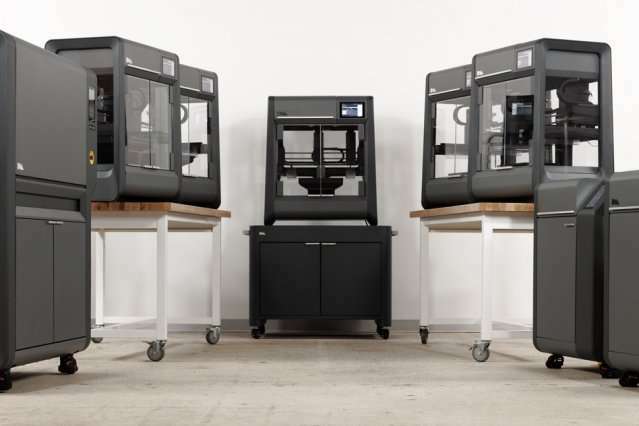 The company's first product, the Studio System, improved the safety, speed, and price point of 3-D printing prototypes and small batches of metal parts. "Metal manufacturing is one of the biggest drivers of manufacturing overall, and manufacturing drives the world," says Desktop Metal co-founder A. John Hart, an associate professor at MIT's Department of Mechanical Engineering and the director of the Laboratory for Manufacturing and Productivity. "3-D printing is an amazing technology in terms of its capabilities and how it reshapes the product life cycle, but we're in such early stages that innovative processes are needed to open the floodgates." In pursuit of that goal, the founding team, which includes four current MIT professors and an alumnus of the Sloan School of Management, has overseen a remarkable degree of innovation that's led the company to file or be in the process of filing over 200 patents. In 2012, Ric Fulop MBA '06 was a general partner at North Bridge Venture Partners when he saw a business opportunity in the fact that current processes for 3-D printing metal were far too slow for mass production and far too expensive for prototyping. He spent the next three years looking for the right company to tackle those problems before deciding that he should start the company himself. The six people with whom he founded the company include Hart; Kyocera Professor of Materials Science and Engineering Yet-Ming Chiang; materials science and engineering Professor Christopher Schuh; and mechanical engineering Professor Ely Sachs, an early pioneer of 3-D printing who invented the widely used method of binder jet printing. The other co-founders are computer-aided-design software veteran Rick Chin, and Jonah Myerberg, who worked with Fulop at a previous company and currently serves as Desktop Metal's chief technology officer. "We got together and said, 'Let's start inventing,' and that was an amazing experience," Hart recalls. "Desktop Metal didn't spin out of IP from any of our labs. It was a team founded around an opportunity and a vision that then required rapid invention and innovation in the context of market need." Among the team's breakthroughs was a printing technique called bound metal deposition, which works by extruding metal powder mixed with a binding agent, in a similar fashion to the layer-by-layer process that's common in plastic 3-D printing. The parts are then placed in a debinder, where a proprietary fluid dissolves the binding agent, before they are sintered and densified in a furnace. "We turned metal 3-D printing into something office-friendly that you can put anywhere," Fulop says. "You just plug it in and you can make metal parts." The firm's Production System leverages another proprietary technique called single pass jetting, a complex but outwardly smooth process in which a print head with powder spreading units on either side slides back and forth across a build area. With each pass, the printer deposits precise layers of metal powder before jetting a binding agent onto the powder. Each layer of powder is as thin as a human hair. According to the company, the system is the world's fastest metal 3-D printer, 400 percent faster than the closest binder jet system and 100 times faster than today's laser printers. "A big part of the inaccessibility up to this point has been the cost and speed of printing," Hart says. "If you've ever watched a 3-D metal part being printed … some plants grow faster." Fulop estimates that two dozen Production Systems will be shipped in 2019 as the company continues to scale. 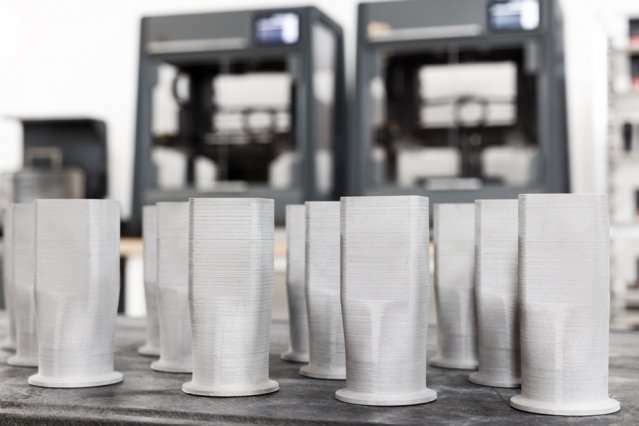 With orders rolling in, many of Desktop Metal's customers are looking to purchase multiple systems to print at volumes much higher than 100,000 parts. "When people say that 3-D printing is going to be 20 or 40 percent of manufacturing in some number of decades, I think, 'Probably not,' and then, 'It's too early to tell,'" Hart acknowledges. "That said, it's so early that I'm confident the additive manufacturing industry will grow 10- or 100-fold in the next five to 10 years or so." "3-D printing lets you transform complexity to simplicity," Hart explains. "Consider how many products require the concurrent engineering and eventual assembly of many parts, and how the design constraints and logistics of manufacturing shape how we develop products. 3-D printing lets you consolidate assemblies into single parts, and design for optimal performance. Thinking only about the cost of 3-D printing ignores the incredible value unlocked by new designs, and by speed and flexibility on operations. When you think about those aspects hand in hand, you see the real breakthrough."